How do Scientists Use Models? SWBAT identify the various uses for models in science and create a model of Earth that would fit one of the uses identified. 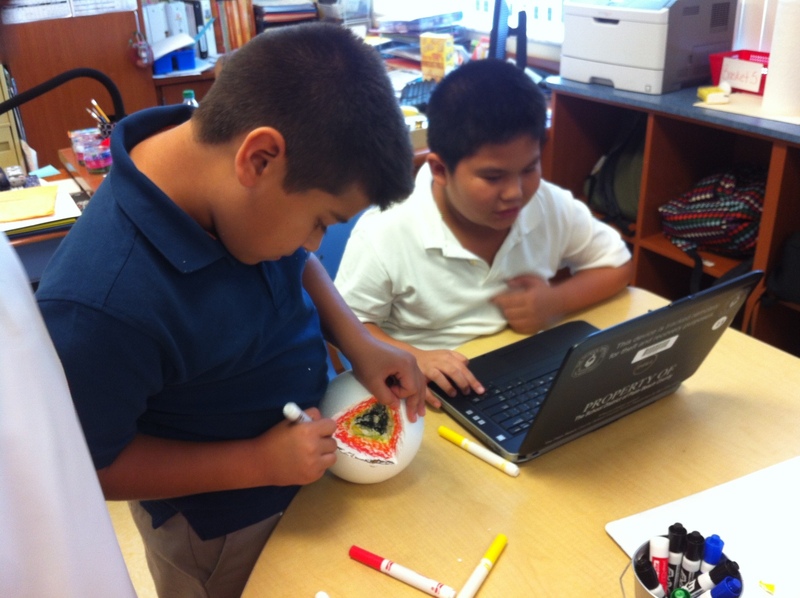 Students act as scientists by creating various models of Earth. Creating models is a practice used by scientists for many purposes. 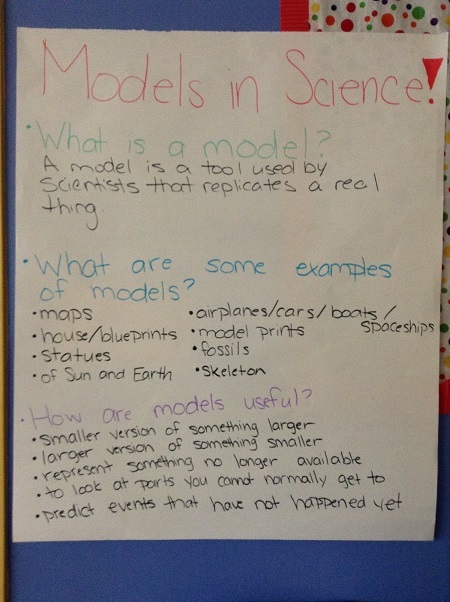 Students learn a variety of reasons scientists use models and understand there are a variety of types of models. They will be applying this knowledge about models throughout the year when they make a model of matter in standard 5-PS1-1, use models to illustrate the flow of energy in standard 5-PS3-1, develop a model to show how matter moves through an ecosystem in standard 5-LS2-1, and when developing a model to show the relationship between Earth's layers in standard 5-ESS2-1. Students will demonstrate their understanding of the purpose behind modeling by explaining it in their own words on an exit ticket. Gather materials that are examples of each type of model. I used a mini globe of the Earth, diagram poster of a cell, 3-d model of human body, world population graphs, and a Youtube video of a hurricane trackerï»¿ (link can be found in the guided practice section below). To begin today's lesson, students create a list of all of the things they think scientists might make a model of and/or of models they have seen before. I ask them to record the list on the white board I have provided each group. I tell groups that may be struggling to think of all of the places they may have seen models, such as at museums, zoos, the dentist, doctor office, etc. After about 3 minutes, I tell groups to stop writing, put the caps on their markers, and put their markers down. Having them first create a list of models from the real world that will help lead them to tell me why scientists have created models of these things. The goal at the end of this lesson is for students to understand that models are used in science for a variety of reasons and to create a model that fits one of those areas. I start an anchor chart on a large sticky pad in front of the class. The first Question on the anchor chart is “What is a model?” The second question is “What are some examples of models?” The final section is headed with “Uses of models in science:” I skip the first section, and have groups begin telling me items that are on their list. 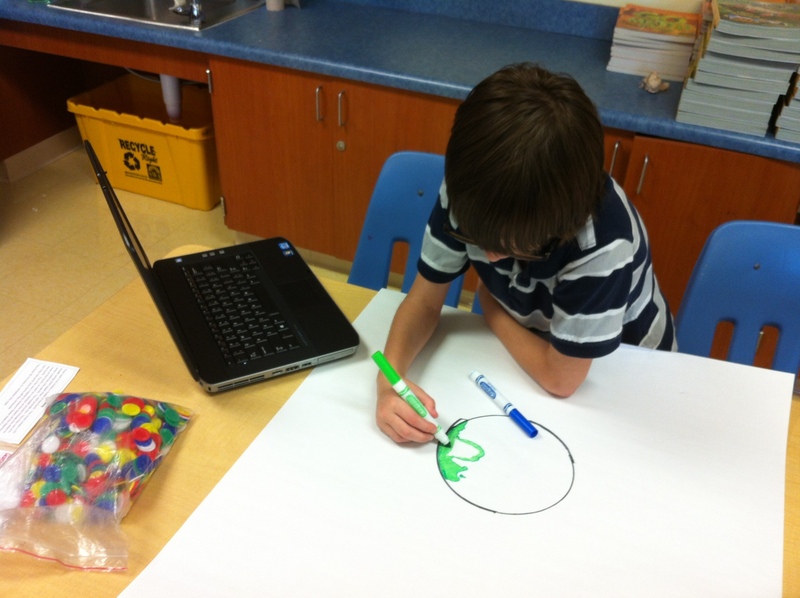 I begin adding items to the second section of the anchor chart. After we have a list of about 10 – 15 items of things that scientists create models for, I tell them to think about the why. Why do scientists create models of these items? I begin this portion of the lesson by asking students for their thoughts on why scientists create models of each of the items listed on our anchor chart. For example, why do scientists create models of dinosaurs? What about cells or the Earth? For each of these items, a model serves a different purpose. As students share their thoughts, I record the reasons in the last section of the anchor chart. Although scientists use models for many different reasons, in this lesson I am trying to lead students to identify five of them. Reason 1: Models are used to represent things too small to see without powerful technology. Reason 2: Models are used to scale down things too large to see as a whole, or hold and manipulate for studying purposes. Reason 3: Models are used to represent things no longer around or available. Reason 4: Models are used to predict things that have not yet happened. Reason 5: Models can be used to represent things that may be hard to get to or manipulate because they are hidden behind or inside other things. There are other reasons scientists use models, but these cover the majority of the ones we will work with this year. If they do not identify the reasons listed above, I ask some questions to lead them to see these reasons. I ask students why scientists would use this type of model (show something that has yet to happen). I explain that this is an example of a computer model because it is generated on the computer using graphical images. 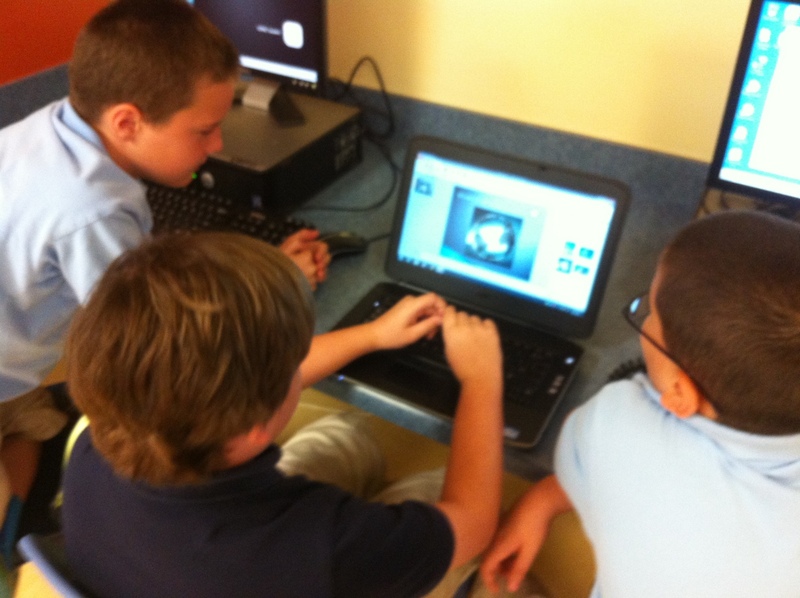 Now it is time for the students to put what they have learned to use by creating a model of their own. 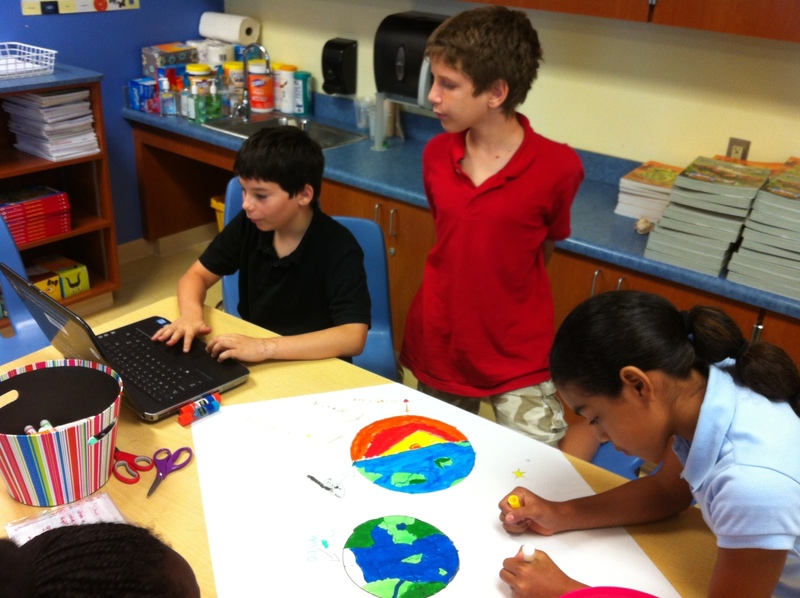 I explain to the students that they will be working in groups to create a model of the Earth. Groups will be responsible for creating different types of models and explaining their purpose. I have the four corners of my room labeled with signs: I am good on the computer sign, I like creating things with my hands sign, I like drawing sign, I like math sign. I point out the signs to the students and tell them to stand up, push in their chairs, and stand behind their chairs. I tell them they have 3 seconds to walk to the corner that best fits them, if they are not in a corner in 3 seconds, or if I catch them running, I will choose the group they go to. Students move to the corner that best fits them, and I use that to divide students up into groups. The two corners that have the most students, I divide up into 2 groups, making a total of six groups with no more than 4 students in each group. I give directions to all groups, explaining that their task is to create a model of Earth using the method indicated on their model group task cards. I hand each group their task card to read over. While they begin reading, I set the overhead timer so students can see the countdown for their 30 minutes. I circulate to observe and offer assistance where needed. The buzzer sounds for their time to be up for working on the models. I get the attention of all the students and ask any group with a zip drive to bring it to me and go to their seats. The students in the other groups remain where they are. I ask each group to share their project by showing what they have created, telling what type of model it is, and how it could be useful to scientists. As the groups begin sharing I upload those saved on zip drives and leave them open on my computer for those groups to share. Each group only takes about 30 seconds to show their model and explain. After all groups share, I pass out an index card to use as an exit slip, I explain that models take many different forms as we have seen. I ask them to consider the first question on the anchor chart which is still unanswered…”What is a model?” I ask them to write their name on the index card, and to answer that question with a complete thought. I rephrase the question to help guide them, I rephrase it as "What do all models have in common that is an overarching purpose behind them?" I collect these as they complete them. I will add one of the best answers to the anchor chart and share with them the following day as we review.